You may recognise him as a screen and television star. 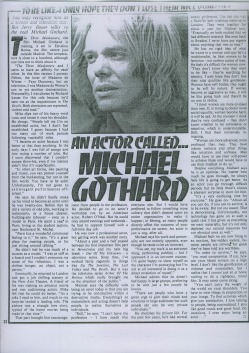 But Jerry Bauer talks to the real Michael Gothard. The Three Musketeers, the film Michael Gothard is making, is set in Estudios Roma, the film centre outside Madrid. The temperature is close to a hundred, although one tried not to think about it. Mike slips out of his heavy wool tunic and tosses it over his shoulder. He shrugs. “People tell me I’m an established actor, but I don’t feel established. I guess because I had too many out work periods following successful roles. “I became an actor because I was better at that than anything. In the early days I was full of energy and into trying a number of jobs. But I soon discovered that I couldn’t escape show-biz, even if my instinct didn’t like it’s superficiality. “In other art forms, like painting and music, you can protect yourself from the huckstering, but not in the film world. You have to be sold! Unfortunately, I’m not given to extravagant performances off-screen. He says he didn’t finally make up his mind to become an actor until he was twenty-one. Before that he did a variety of odd jobs, working in restaurants, as a house cleaner, building site labourer – even as a model in Paris. He spent a year in Paris, living in the student section, near Boulevard St. Michel. Eventually, he returned to London and got a job shifting scenery at the New Arts Theatre. A friend of his was making an amateur movie and was auditioning actors. Mike felt that he could do better. “As a joke I read to him, and much to my surprise landed a leading role. The picture was a triangle love story, typical of the home movies being made at the time. That part brought him encouragement from people in the profession. He decided to go to an actor’s workshop run by an American actor, Robert O’Neal. But he could only attend evenings and weekends – he had to support himself with a full-time day job. He was now a professional actor, but getting work was another story. Michael says the difficulty with being an actor today is that you are trying to be constructive within a destructive media. Everything’s so materialistic and acting doesn’t help people to realise themselves as individuals. “Still,” he says, “I can’t leave the profession – I have needs like everyone else. But I would have preferred to follow something more solitary that didn’t depend upon an entire organisation to make it happen; in filming, so many people directly affect the outcome of your performance on screen. An actor is just a cig, after all. Michael says his work and personality are not entirely opposite even though he tends to be an introvert. Michael admits that he doesn’t feel happy in large groups, preferring to be with just a few people he knows. He has no rigid idea of what he wants in a woman and says he’s a traditionalist, he likes women to be feminine – not carbon copies of men. He feels it’s difficult for women now. “They don’t know who they want to be like – they’re searching for identity. I only hope they don’t lose their nice qualities lke gentleness. Women have soft bodies, they ought to be soft by nature. If women become as aggressive as men, it will be like going back and they’ll be no on to idolise. “I think women are more civilised than men. If, in trying to obtain more social equality, women become hard, it will be sad. At the moment I think they’re very confused – they don’t know whether to be submissive or assertive, which is understandable, Still, I find them immensely intriguing. Despite everything Michael says he is an optimist. No matter how much he goes through, he always feels life is going to get better. As an actor you go through difficult periods but he feels there’s always a pleasant surprise in store for him. Michael feels we are now living in an anxious, fear-ridden society, because people are striving for goals they’ve been told are worthless. “In order to survive,” he says, “you must compromise. If not, how can your ideals remain on a high level. I don’t like the glorification of violence and materialism, but I realise that I cannot just at home waiting to do a righteous, moral film. It may never come along.